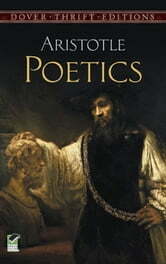 Among the most influential books in Western civilization, Aristotle's Poetics is really a treatise on fine art. In it are mentioned not only epic and dithyrambic poetry, but tragedy, comedy, and flute and lyre playing. Aristotle's conception of tragedy, i.e. the depiction of a heroic action that arouses pity and fear in the spectators and brings about a catharsis of those emotions, has helped perpetuate the Greek ideal of drama to the present day. Similarly, his dictums concerning unity of time and place, the necessity for a play to have a beginning, middle, and end, the idea of the tragic flaw and other concepts have had enormous influence down through the ages. Throughout the work, Aristotle reveals not only a great intellect analyzing the nature of poetry, music, and drama, but also a down-to-earth understanding of the practical problems facing the poet and playwright. Now, in this inexpensive edition of the Poetics, readers can enjoy the seminal insights of one of the greatest minds in human history as he sets about laying the foundations of critical thought about the arts.